I am a HUGE fan of the Chase lineup of personal and business cards. They are great cards for everyday spending that happen to come with a great sign up bonus. I would recommend that anyone who doesn't have a business and a personal card from Chase to apply for one now. (At the same time). Here is the phone number for the Chase reconsideration line if you don't get immediate approval. Just tell them you need both a business and personal card to keep the expenses separate. Here is the lineup of the current Chase cards that are not branded to a hotel or airline. With all four cards you earn Chase Ultimate Reward points. The Ink Bold and Ink Plus allow you to transfer your points directly to a variety of programs: United, British Airways, Korean Airways, Southwest Airlines, Hyatt, Priority Club/Intercontinental Hotels Group, Marriott, Ritz Carlton, and Amtrak. The Ink Classic and Ink Cash points cannot be directly transferred to loyalty partners, but if you, your spouse, or your significant other have an Ultimate Rewards non-limiting account (Chase Sapphire Preferred, Chase Ink Bold, Chase Ink Plus), you can transfer your points into this account. From there you can transfer the points into a airline/hotel partner account. You MUST be careful these days transferring points to anyone other than a spouse or significant other living in the same household. There are rumors circulating that Chase is shutting down accounts for violation of the Terms and Conditions which prohibit these transfers. You might forfeit points in the account for violation of the T&C. So what makes UR points so valuable? First of all, I find I can rack up UR points by the tens of thousands each month. I try to stop into Office Depot or Staples at least once a month. I will buy $2000-2500 in Visa or Amex gift cards (at 5X points, that's 10-12,500 UR points) to be used for items that I might typically pay with cash, or for items that have no bonus category. (Like dental supplies or lab bills). At the end of the month, my wife calls the labs and uses those cards to pay bills. You also earn 5X points on cell phone, cable and satellite TV and internet. You have to be careful not to have all your purchases on your Ink Bold at office supply stores. Chase has been know to shut down accounts for points abuse. If however you are spending $10,000/mo on that card, no one will know the difference. The other thing that makes them so valuable is their flexibility. I can't emphasize enough how valuable that is. Let's say you have 30,000 miles in your United account and you need 35,000 miles in order to book a flight. (I don't typically fly United, so I am not as familiar with their FF program). You can top off that account by transferring 5000 UR points into your United account and be able to book your award flight before that seat is gone. Another reason is when you have points in one particular program, then you need that program to have the award you want, at the time you want to fly, or in a place that you want to stay. 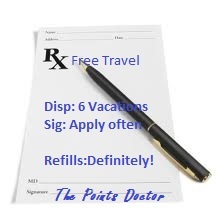 With the flexibility of UR points, you have many more options to choose from. You may not know exactly where you want to go when you’re accumulating points, and different programs are simply better for redeeming to different destinations. In general, your best hotel redemption for UR points is Hyatt. Hyatt's top category 6 properties only require 22,000 points. Marriott's top properties on the other hand are valued at 50,000 points. In other words, you can get twice as many nights at Hyatt than you can at Marriott for the same number of points. Marriott's award chart is not based on the cost of the rooms, but on the popularity of redeeming award nights at a particular location. As far as airline transfers, I have been told that United is the best value. Their award chart is reasonable and available on Star Alliance partners is really good in business class to Europe and Asia. No fuel surcharges, either. Another great use of UR points is to transfer them to Southwest Airlines after you have received the sign up bonuses for the Chase Southwest business and personal cards. This tops off the account enough for you to earn the best perk in the airline industry. The Southwest Companion pass. More on this one another time! One last reason is that sometimes points in an account that you have are about to expire. Simply transferring UR points into that account counts as activity to keep the account active, preventing you from losing your hard earned points. UR Points transfer to several of the programs literally instantly, and to anyone’s account you wish. (Unlike the transfer of UR points from one person's UR account to another person's UR account I was referring to earlier). So there you have my top reasons why Ultimate Reward points are the most valuable. Ease of accumulating them, and ease of transfer when you need them now! How do you use your UR points? Are you and aspirational traveler or a weekend warrior?